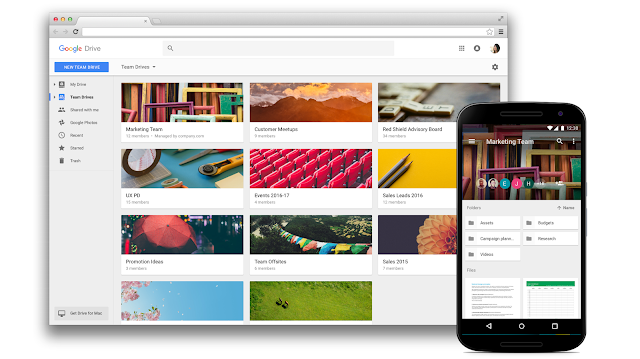 that we would soon launch an Early Adopter Program (EAP) for the Team Drives feature in Google Drive. We’re now ready to accept applications for that EAP, which will kick off shortly. Team Drives are shared spaces where teams can store their files and guarantee that every member has the most up-to-date information, no matter the time or place. Team Drives make onboarding easy, because every person and Google Group added to a Team Drive gets instant access to that team’s documents. Moreover, Team Drives are designed to store the team’s work collectively, so if a document’s creator moves off of the team that document doesn’t go with them. Advanced access controls make Team Drives even more robust, preventing team members from accidentally removing or deleting files that others need. The Team Drives EAP is only open to G Suite Business and Education customers. Only G Suite admins can sign up for the Team Drives EAP. If you are not the G Suite admin for your organization, please contact that individual and ask them to sign up. Admins will need to enroll their entire primary domain in the EAP. They will be able to restrict Team Drives creation to certain organizational units, but all users in the domain will be able to see and access Team Drives. They will not be able to enroll secondary domains. At the moment, Team Drives does not support some features, including adding members from outside of one’s domain, syncing to a desktop computer, and Vault capabilities. Apply for the Team Drives Early Adopter Program (EAP) today, and help teams of all sizes at your organization work better together. In September, we announced that we would soon launch an Early Adopter Program (EAP) for the Team Drives feature in Google Drive. We’re now ready to accept applications for that EAP, which will kick off shortly.